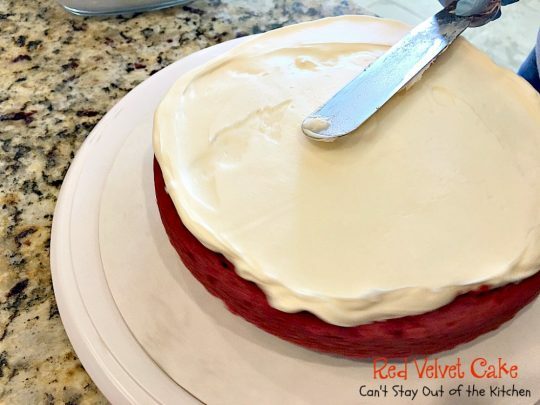 I love Red Velvet Cake especially because it’s iced with a rich cream cheese frosting (usually a double batch!). I like it even more when its piped with extra swirls and roses around the bottom and top. Even better is to throw in a few chocolate and white chocolate shavings on the top! No matter how you make it with lots of toppings or not, I love it. But quite frankly, the more gooey icing on top, the better I enjoy this delightful cake! I made this lovely cake again this past week–about a month after posting the original recipe. I had a friend from church, Hannah Noice, help me decorate it. I think you will love the way it turned out. 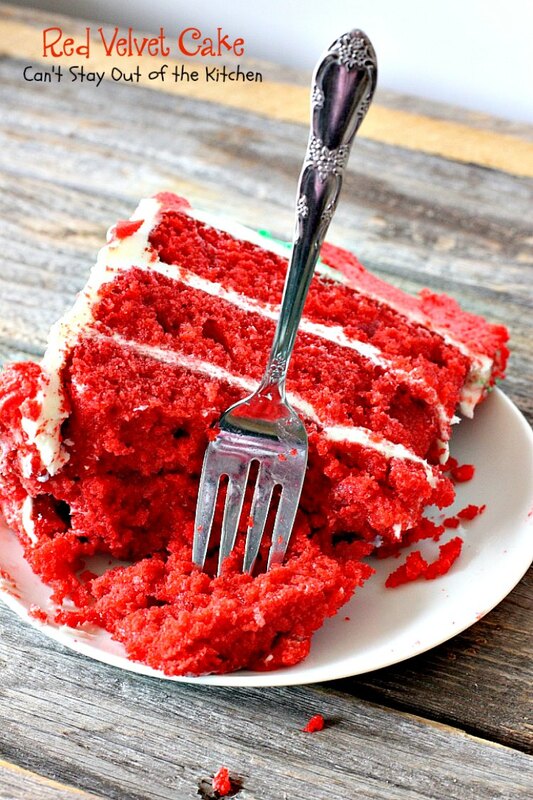 If you’ve never tasted Red Velvet Cake you don’t know what you’re missing. My Red Velvet Cake is moist and delicious. This recipe is truly spectacular and superior to any other recipe for it I’ve tried. And, yes, I have several. 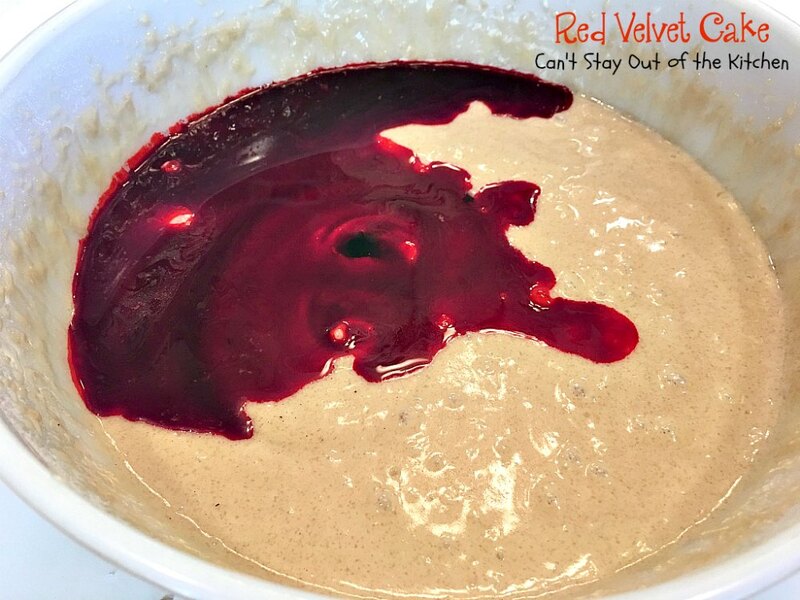 The interesting thing about this recipe is it uses only one teaspoon of cocoa, but a whole bottle of red food coloring. 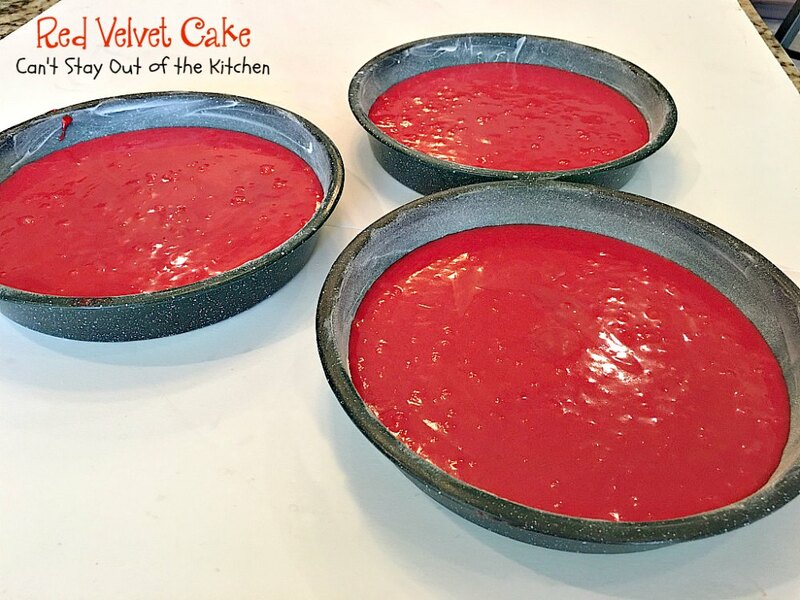 I have two recipes for Red Velvet Cake. The main difference is in the icing. This one has a cream cheese frosting so I’ve determined to showcase it first. 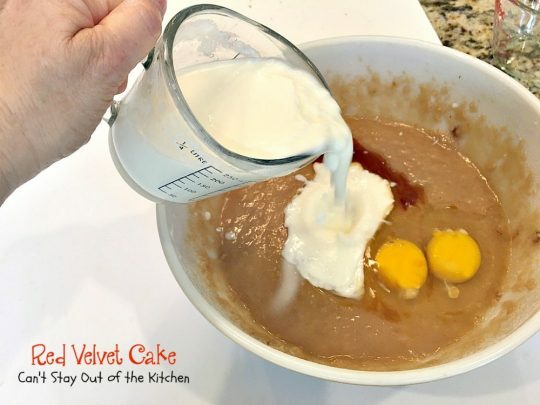 I got this recipe from Sheila Cook, wife of Dr. Gary Cook, former president of Dallas Baptist University. She hosted an afternoon party for students around Christmas one year when I worked there. She had made it in an oblong pan and cut it down to pieces about the size of petit fours, as I recall. It was absolutely fabulous. I have no idea where Sheila found the recipe but it has been around for awhile. 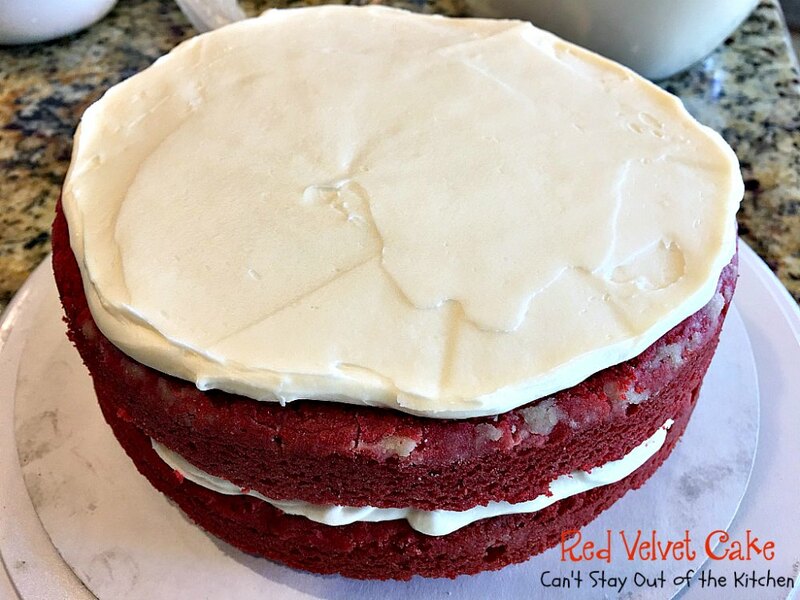 I’m addicted to Red Velvet desserts and I have tons of them. Red Velvet Cheesecake, Red Velvet Cake Roll, Red Velvet Cookie Dough Cheesecake Brownies, and Red Velvet Earthquake Cake are a few of my favorites. 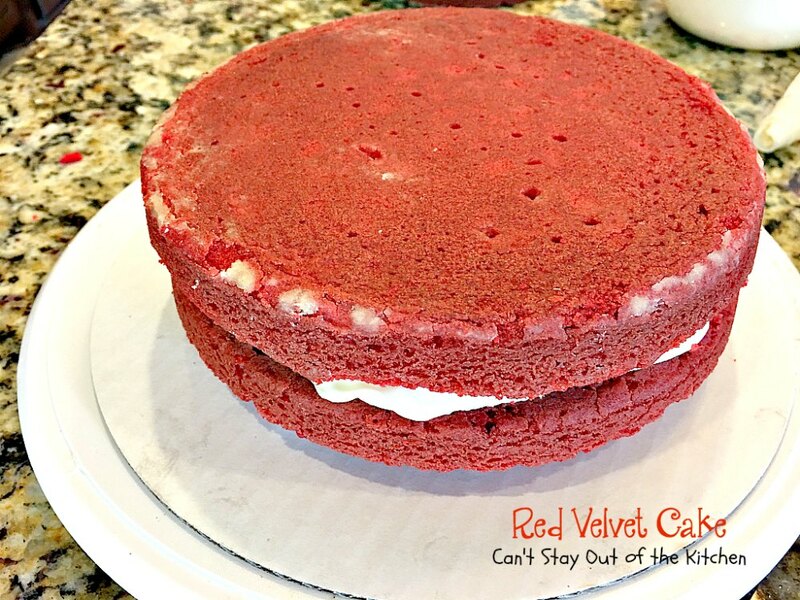 Red Velvet desserts make wonderful party treats. 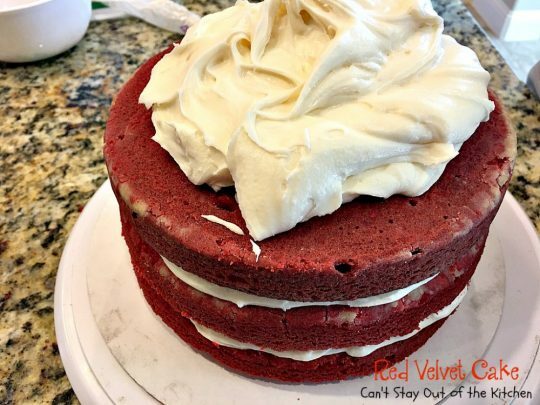 My Red Velvet Cake is a sensational dessert to serve for Christmas or Valentine’s Day parties, anniversaries, birthdays or other special occasions. 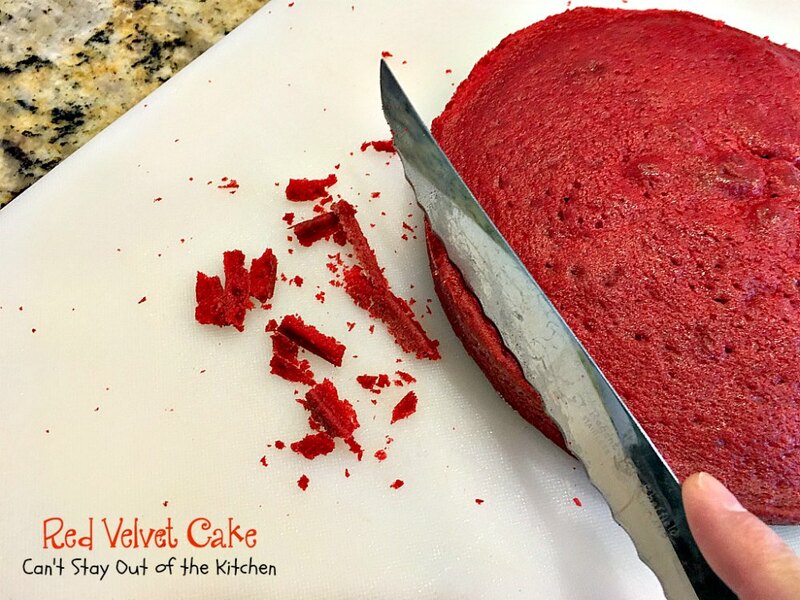 If you want a rich, decadent Red Velvet dessert, I highly recommend trying this lovely Red Velvet Cake. You will drool over every bite–and so will your family and friends. Bon appetit! When I initially published this Red Velvet Cake in August 2012, it was very early in my blogging days. I was taking pictures with an iPhone so they were not as sharp, clear or as beautiful as they deserved to be. 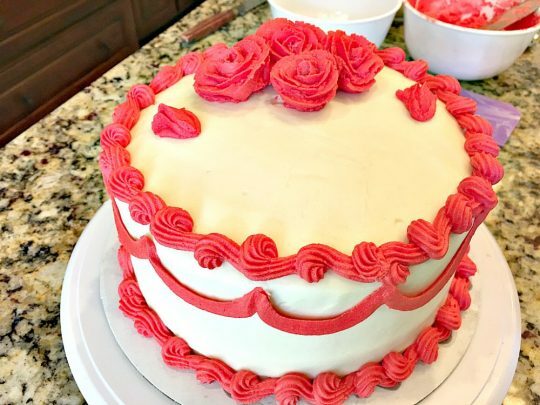 I recently remade this cake (March 2017) for a bridal shower I was having for a friend’s daughter. I served it along with a Carrot Cake and an Italian Creme Cake. Hannah decorated all of the cakes and they got rave reviews for beauty as well as taste. What do you think? Doesn’t Red Velvet Cake look yummy? It’s really a beautiful cake to make either during the Christmas holidays or Valentine’s day. But I made it for a special occasion yesterday. All the ladies who tried it thought it was delicious! 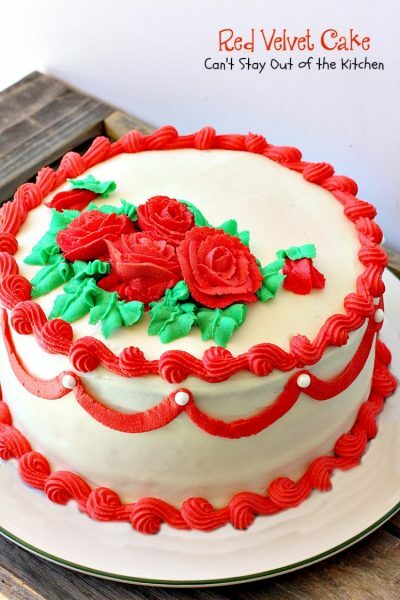 It certainly is one of my favorite cakes. 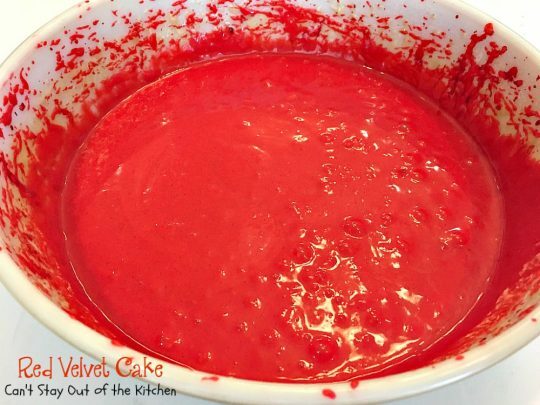 My Red Velvet Cake is very moist, not dry like some Red Velvet Cakes. Even the back of the cake is beautiful. Red Velvet Cake is one of our favorite cakes, but it’s especially wonderful for Valentine’s Day or Christmas. I used these ingredients for the cake. The measuring glass on the left contains soured milk (buttermilk). Place UNBLEACHED all-purpose flour in a mixing bowl. Bleached flour toughens baked goods. Add sugar, baking soda, and cocoa. Add oil. Add vanilla, eggs and buttermilk. Mix with an electric mixer until smooth. 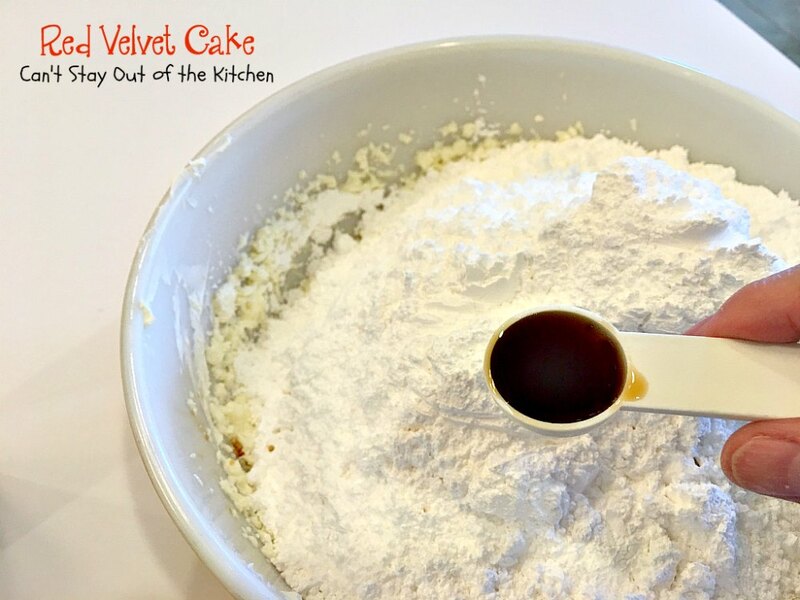 If you don’t have buttermilk you can take a cup of milk and and a couple of tablespoonfuls of vinegar or lemon juice and let it sit on the counter for about 5 minutes. It will curdle and you will have soured milk. Mix with an electric mixer until thoroughly mixed. Grease and flour baking pans really well. Make sure you tilt the pans so the sides get floured too. Try to spread the batter evenly among the three baking pans. Bake in the oven at 350 for 30-35 minutes or so. 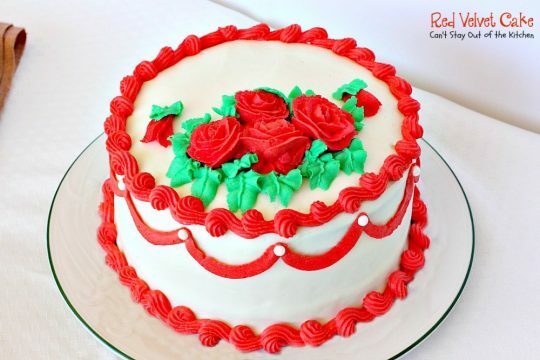 Insert a toothpick in the center and when it comes out clean the cakes are baked. 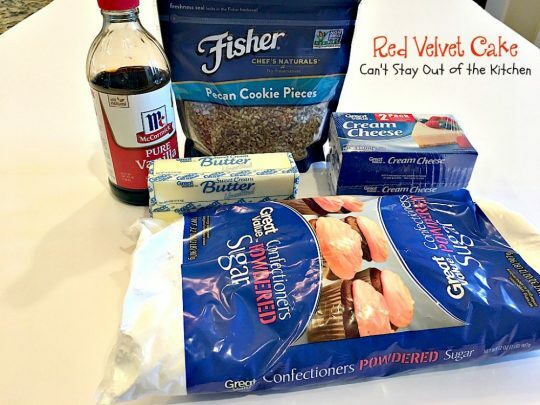 I used these ingredients for the icing, except I chose not to use the pecans this time. Usually I place them on the sides if I’m not going to put decorative icing on the sides. For the icing: Soften butter. 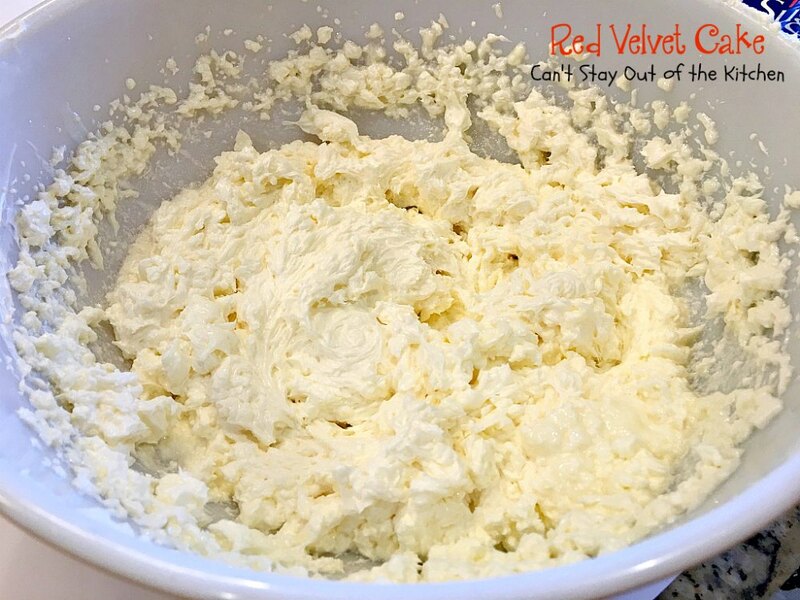 Add cream cheese. 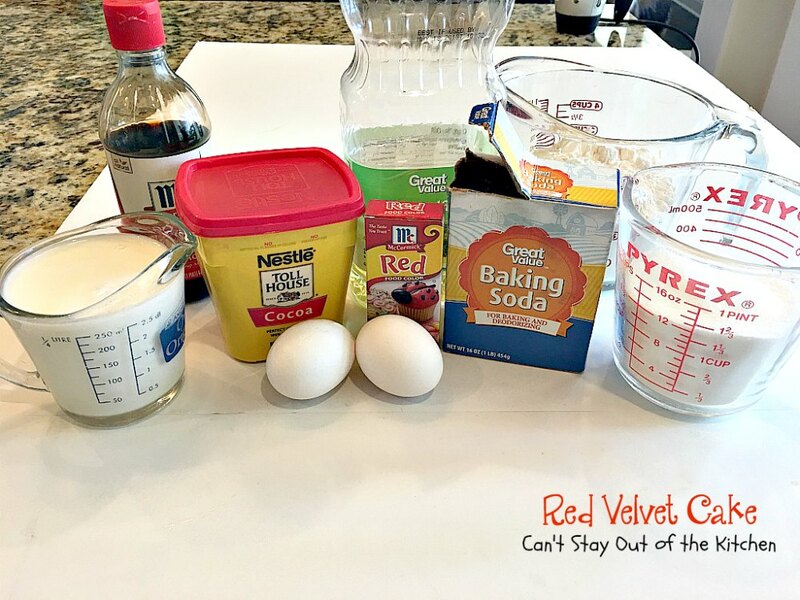 Mix ingredients with an electric mixer until smooth. Add powdered sugar and vanilla. You may have to add more powdered sugar than the recipe calls for if the mixture seems weepy. 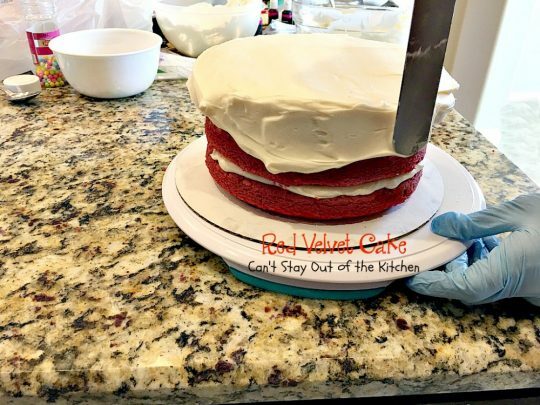 Trim the hard edges off the edges of the cake. 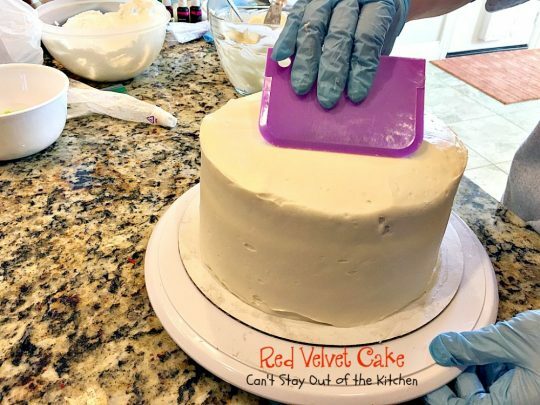 Place some of the cream cheese frosting on the bottom of the plate so the cake adheres well and doesn’t topple over or move out of place. 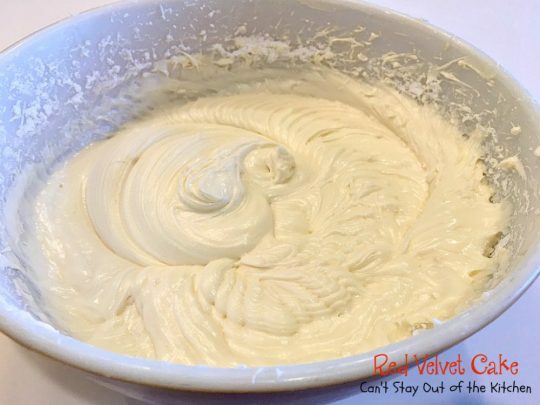 Spread cream cheese frosting over top of the cake. We placed the cake on a turntable and turned it with one hand while spreading the icing with a spatula in the other. Top with another trimmed cake layer. 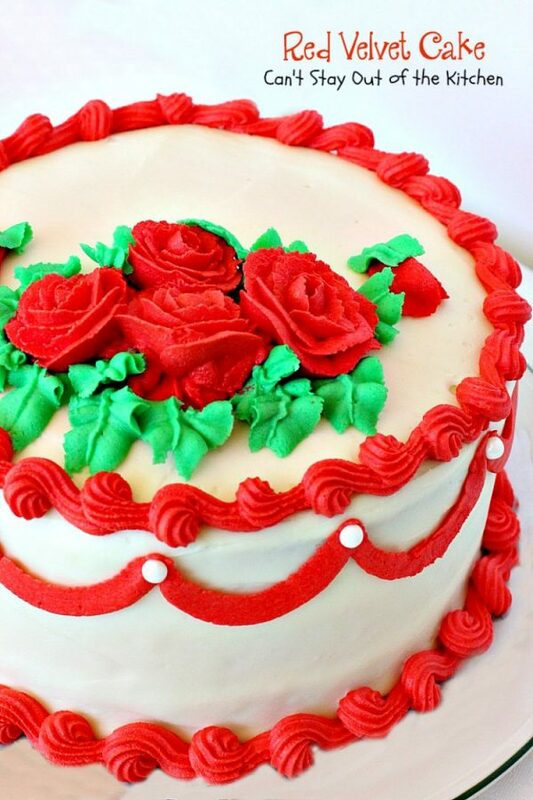 Spread cream cheese lavishly on top of the cake. This is a supposed to be a rich, decadent cake. Don’t be stingy with the icing. I usually make a double batch for this cake. I would recommend that you do that too. Add the third trimmed layer of cake. Slather top of cake with a lot of cream cheese frosting. Spread the icing on top and the sides of the cake. Scrape the sides and edges of the top so icing is smooth. Hannah added a bow around the cake. 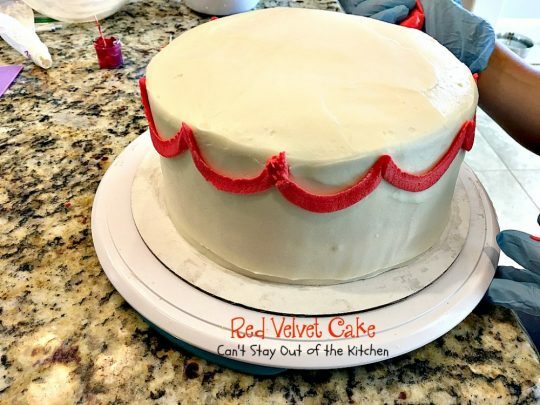 We used a reverse border on the bottom and the top of the cake. Hannah prefers to make the roses on a stick although many prefer to make it on a small rose platform. Here the roses have been added to the top. Here the flower petals and beads have been added. 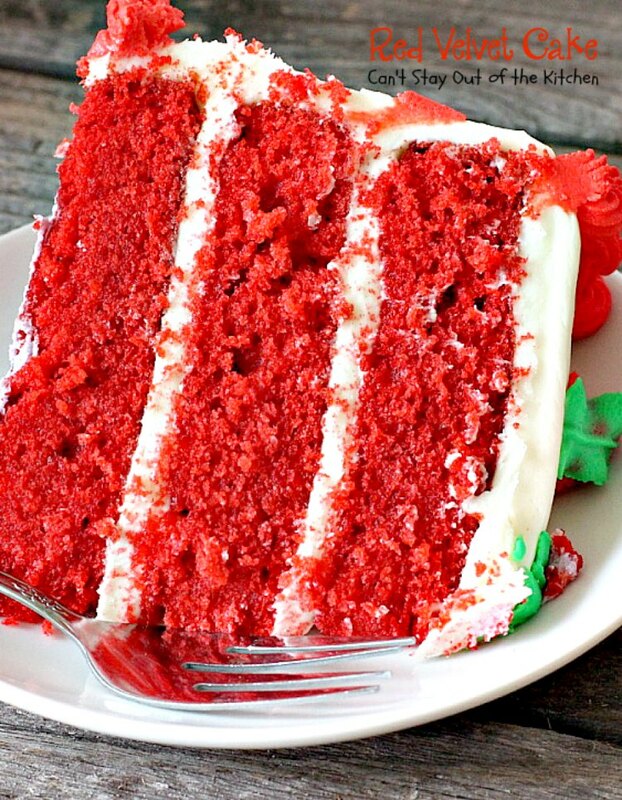 Red Velvet Cake is so wonderful. I ate way too many pieces of it. Here’s a bird’s eye view of the top. 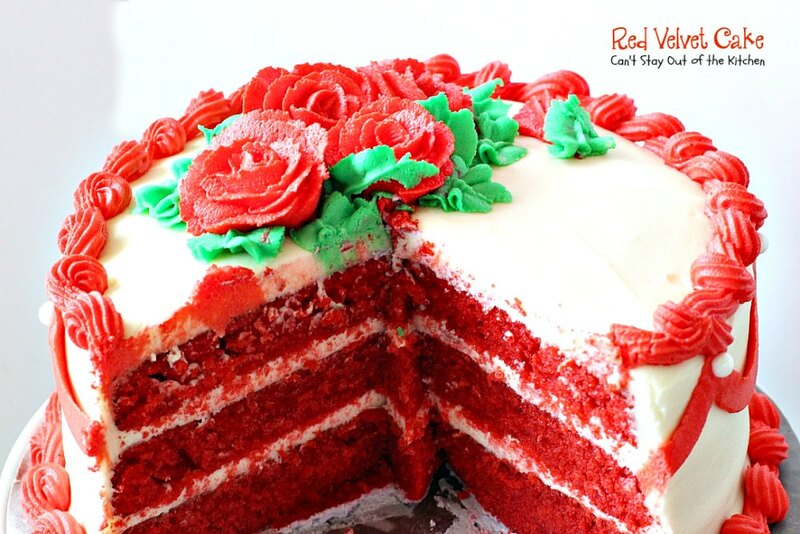 Red Velvet Cake is perfect for special occasions like Christmas, anniversaries or birthdays, or Valentine’s Day. This elegant cake is so scrumptious you will want to make it frequently. 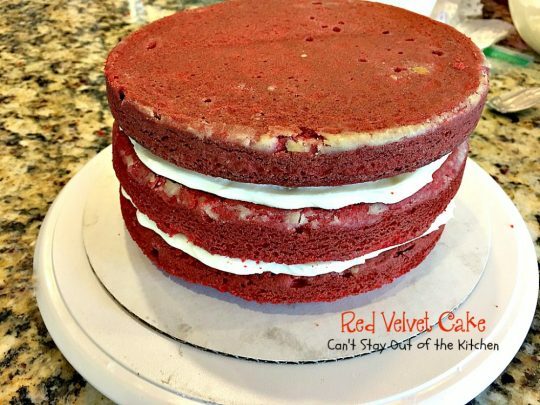 Spectacular chocolate cake with outrageous red velvet flavor and a luscious cream cheese frosting with pecans. 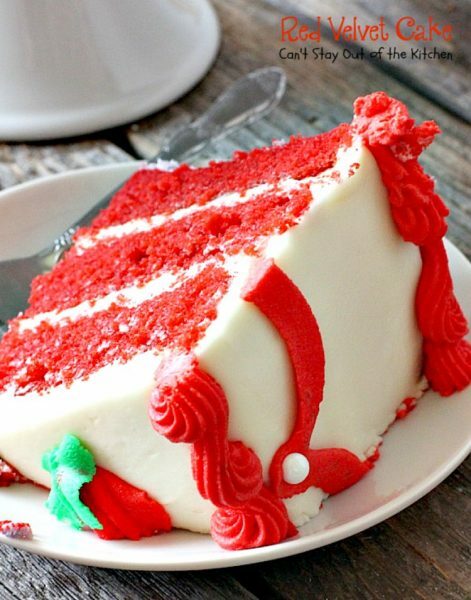 This cake is great for Valentine's Day, Christmas, and special occasion desserts. 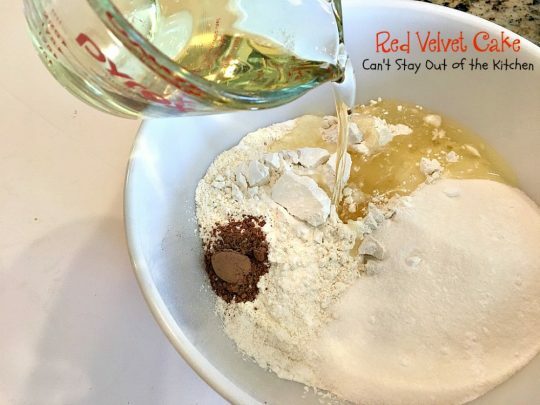 Mix flour sugar, soda and cocoa with oil. Bake in oven at 350° for 30-35 minutes in 3 9” greased and floured baking pans. 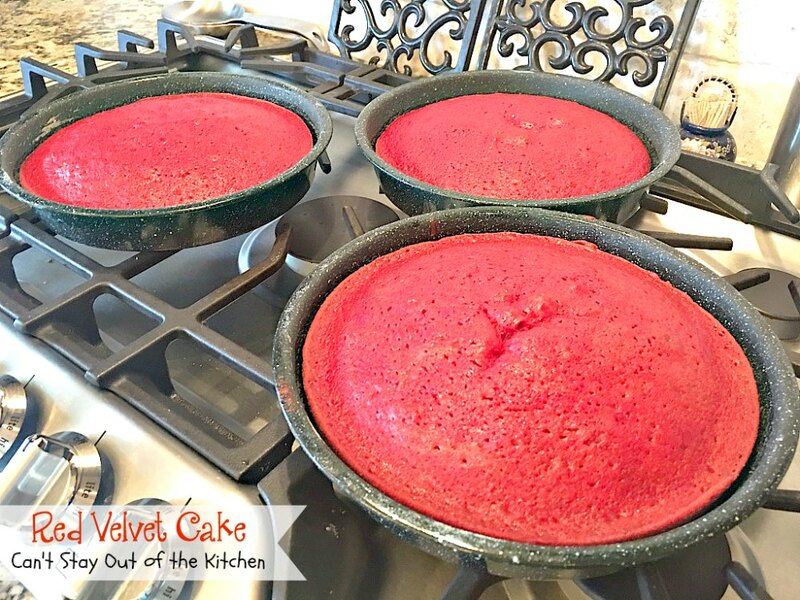 Vary time if using only 2 layers or oblong pan). NOTE: Double icing recipe if you want an extremely rich cake. 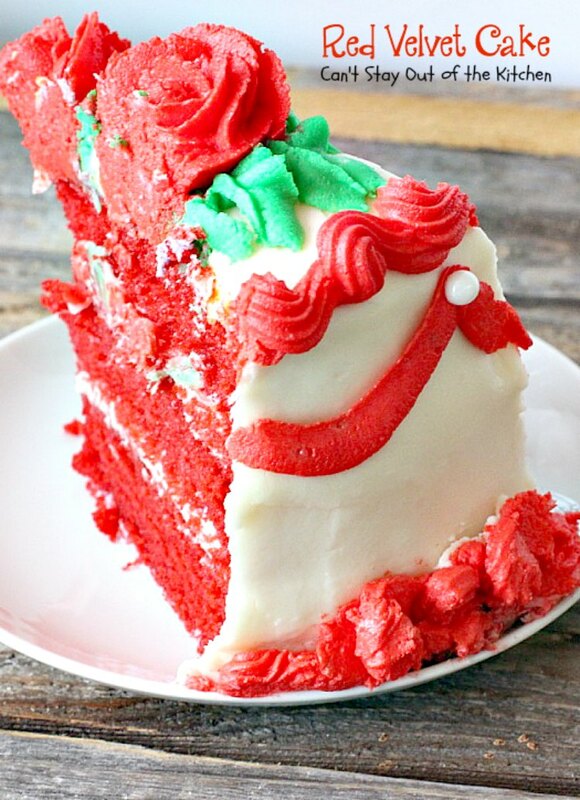 NOTE: This will not be enough icing for 3 layers, only for oblong or 2 layers. 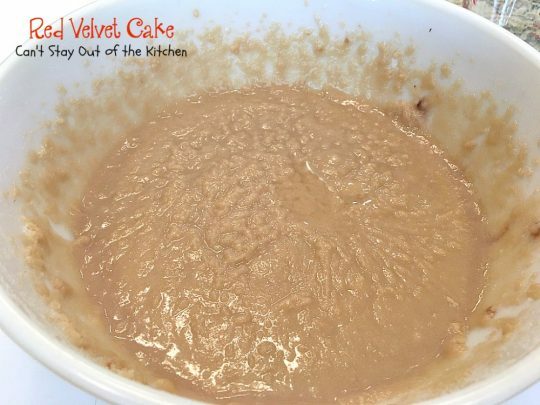 NOTE: If you want to decorate the top of the cake, don't stir the nuts into the icing. 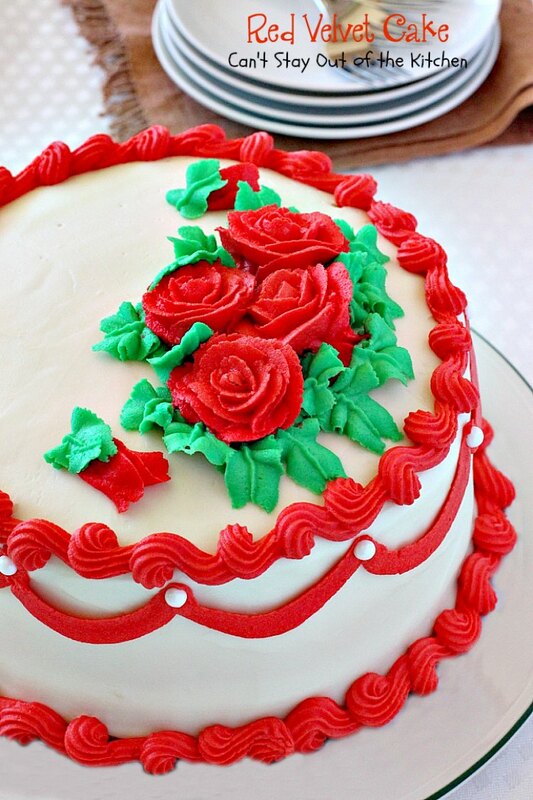 Press them into the side instead and decorate the top as desired. NOTE: I chose to leave the nuts off the icing for these pictures. NOTE: To make buttermilk, measure regular milk into a glass measuring cup. Add 2 tbsp. white vinegar or lemon juice. Allow mixture to sit out about 5 minutes before using. 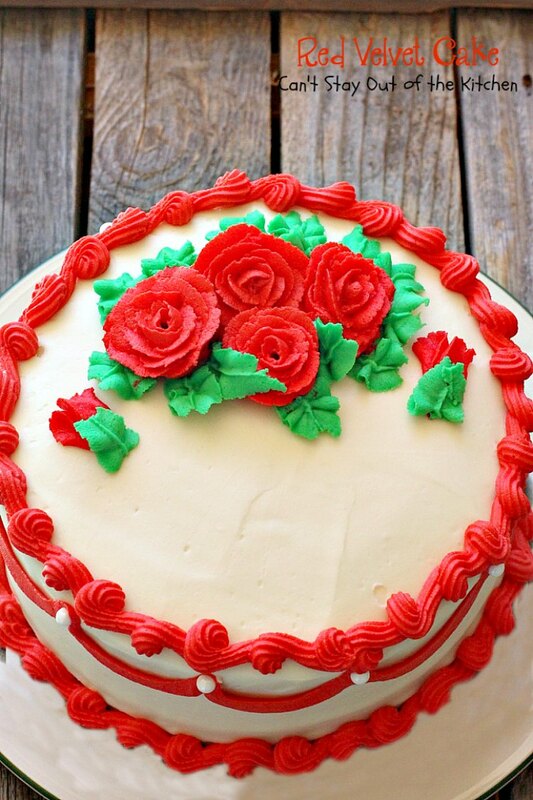 NOTE: Preparation time does not include time required to decorate cake with roses, trim and beads. 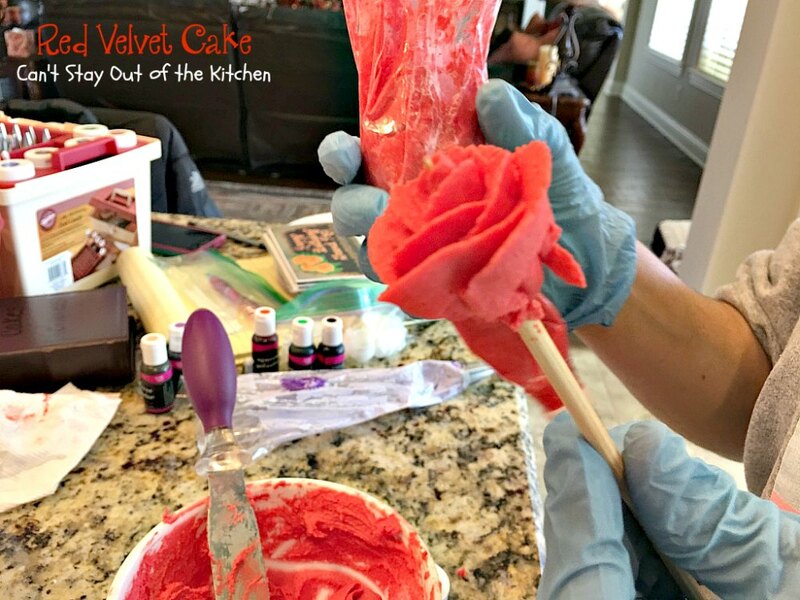 NOTE: While my cake layers took 35 minutes to bake, the original recipe states that the layers should be done after 20 minutes. Check oven, your cakes may be done more quickly than mine. Spectacular chocolate cake with outrageous red velvet flavor and a luscious cream cheese frosting with pecans. This cake is great for Valentine’s Day, Christmas, and special occasion desserts. Bake in oven at 350° for 15-20 minutes in 3 9” greased and floured baking pans. Double icing recipe if you want an extremely rich cake. [br][br]This will not be enough icing for 3 layers, only for oblong or 2 layers. [br][br]If you want to decorate the top of the cake, don’t stir the nuts into the icing. Press them into the side instead and decorate the top as desired. Red Velvet Cake is a fantastic cake to make for special occasions like bridal showers! Every bite of Red Velvet Cake is so mouthwatering. This is one of those cakes that gets rave reviews every time I make it. I usually make a double batch of cream cheese icing for this cake so it’s incredibly rich and decadent. Every forkful will have you drooling. Thanks, Rose. 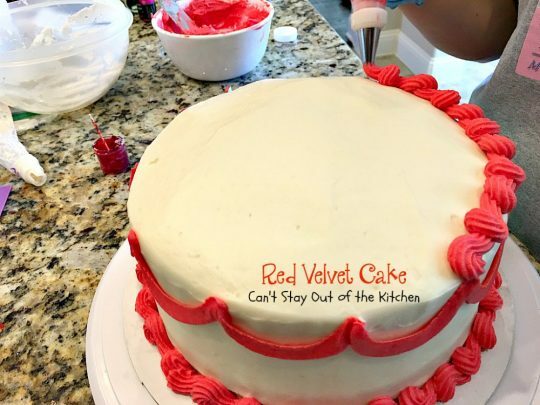 This is one of our favorite cake recipes. So moist and delicious. It looks great. 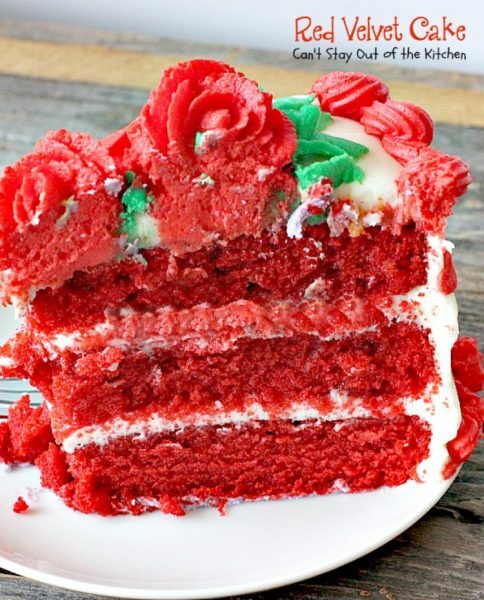 As I’m vegetarian, can you suggest me “without egg” recipe, like what one can do get soft and delicious cake without using egg, or is it possible or not? Sahana, this recipe also has cream cheese, do you have a cream cheese substitute? I have heard that you can take flax seed and add it to water. Allow it to sit for a few minutes and this can be used to substitute for the egg. You may need to go online to find out exactly how to do it. You may be able to find a soy substitute for the cream cheese. Please let me know how it works with these substitutions. I have an award waiting for you! Beautiful Blogger Award! Enjoy! Again, thank you. See my note on your blog.